During the time I have been using PP, I found it inconvenient that there was no component to calculate the correlation coëfficient between two properties present in the data stream (for instance when performing external validation of a model). Therefore I have written a component to do just that. One of the features I find useful is the option to include both an upper and lower error margin line. Allowing a quick visual inspection of your model reliability. While in the latest version (8.5) there is a component called "Regression Model Evaluation Viewer" which calculates an RMSE and R2, this component has some downsides. The component calculates the modeled values internally, so it cannot be used to calculate the correlation between two sets of values obtained from external sources. The component only calculates the R2 and RMSE, while for a proper evaluation R02 and k-slope are also required. It has been tested up to a maximum of approx. 20,000 records and works fine. In addition the parameters that are also calculated in the 'Regression Model Evaluation Viewer' and 'R-statistics fit plots' are identical. The component calculates correlation parameters according to Tropsha (2010) 1 between two properties present in the stream. These properties are defined as 'Activity' (Y-values) and 'Model' (X-values). These have to be present in the stream and therefore need to be pre-calculated in the case of a model. In addition, a scatter plot containing all values is output. 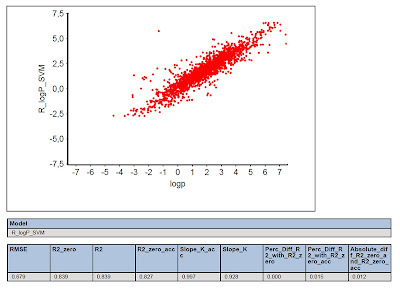 Both the parameters and the plot are output as reporting items. Under 'Plot Parameters' variables for the x-y scatter plot can be defined. Furthermore the range of the upper and lower error lines can be set (default 0.5 from the line of unity). 'Auto_range'; when set to 'True' the scale of the axis is automatically defined to the scale of the data. Alternatively; when set to 'False' (default), a range can be entered manually for 'Activity' (y-value) and 'Model' (x-value)(Default is 2.0 - 12.0). 'Uncertainty' defines the margin between the line of unity and the uncertainty lines (default 0.5 units away from line of unity). If 'Uncertainty_in_plot' is set to 'True' (default) then two lines indicating a lower and upper error line are drawn in the plot. If 'Output_Records' is set to 'True' all values are output unchanged to the 'Fail' port while the plot and correlation parameters are output to the 'Pass' port. If for some reason you are heaving trouble with the component, please contact me! Tropsha, A. (2010). Predictive Quantitative Structure-Activity Relationships Modeling. Handbook of Chemoinformatics Algorithms. J. Faulon and A. Bender.